So how did the tagging and rating assignment go last week? If you’re weird like me, tagging and rating photos is kinda fun. I’m all about mindless tasks that I can accomplish while watching t.v., and this task is one of those. 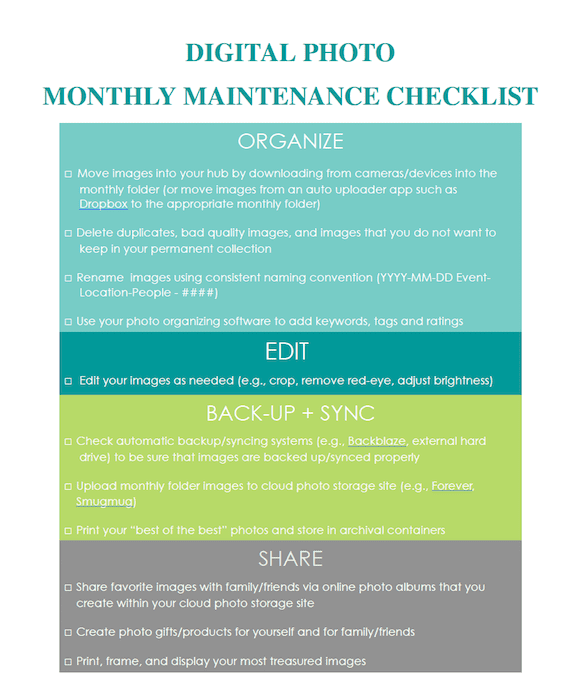 We’re moving on…this week, you’ll create a digital photo organizing maintenance plan. If you’ve completed all of the weekly assignments up to this point, congratulations! You’ve succeeded in organizing the collection of digital photos that you’ve amassed over the years. But what about the images that are yet to be captured in the coming months and years? That’s where your maintenance plan comes into play. As with any organizing project that we complete, our only hope of keeping all of the glorious organizational structure that we’ve worked so hard to put into place is to have a plan for maintaining it over time. 2) a regular “photo management appointment” that you set and keep, in order to complete the list of tasks. Your maintenance checklist should consist of the organizing tasks that we’ve covered during the last 8 weeks of The Challenge (e.g., moving images into hub, deleting duplicates, renaming files, adding tags/ratings. As you complete the organizing tasks, it’s also a great time to edit and touch up your photos. I recommend that you include checking your automatic back up systems and performing any manual back up/syncing tasks as a part of your maintenance plan. And don’t forget the fun stuff…sharing your photos with loved ones! There’s so many ways to share, and we’ll address those next week in the final post in this Challenge series. Since there’s a lot to remember in the process, I find that using a checklist really helps me to cover all my bases when it comes time to complete my list of photo maintenance tasks. 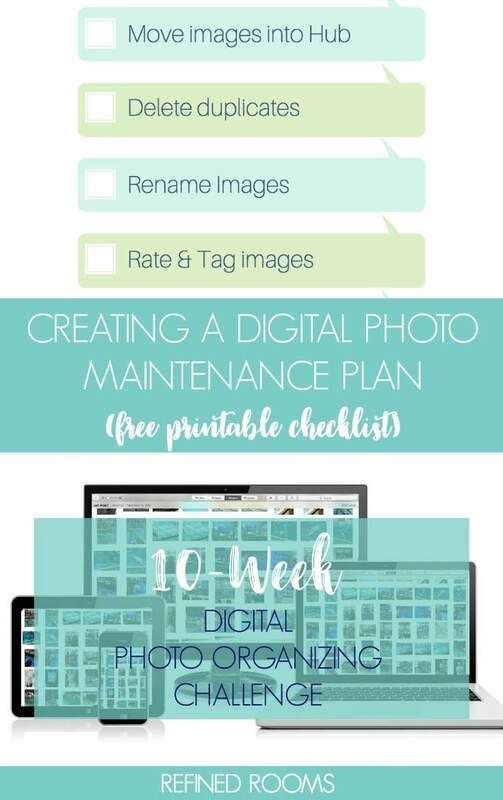 Feel free to download my monthly digital photo maintenance checklist (I suggest printing it out and laminating it so that you can use it repeatedly each month. Just like with paper management, I’m a huge fan of scheduling a regular photo management appointment in your calendar. Creating and keeping this appointment is the key to keeping your digital photo management system well-maintained. How often you schedule your appointments is up to you. I schedule mine on the 1st day of each month, and that works great for me (and for most of the clients I’ve worked with). You need to do what works best for your needs, based on the volume of photos you take. 4. Honor this monthly appointment! 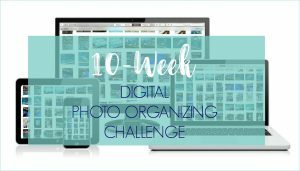 To make the photo organizing process a little easier, I’ve created a free companion resource for Challenge peeps, the Digital Photo Organizing Tool Kit. ~ Now get crackin’ on that maintenance plan! Agreed Mara! Thanks for stopping by! I haven’t yet started working through these steps, but I definitely want and need to. Thanks for spelling out all the necessary steps and providing such a valuable resource! Be sure to let me know when you get started! Maybe a project for 2016?